There are several things I despise in this world: injustice, ignorance, violence toward animals, and baristas who don't know how to make a good macchiato. In addition, I don't like it when someone hasn't heard of a band I am a fan of; if I love a band, I want everyone to know about them and if you say you don't know said band, you're more than likely to receive a mix tape of their best songs the next day. So it pisses me off to no end that Wes Borland's Black Light Burns has received little Australian media. In fact, nobody I've met outside my direct social circle has heard of the band. Of course, mention that he was the guitarist in Limp Bizkit and people's eyes light up; I do, after all, live in the land of the music festival, where the mosh pit should bear a hazardous warning sign and machismo is the order of the day. In 2007, in my role as a music reviewer for several online music sites, I lay in wait for them to send Black Light Burns' album, Cruel Melody, to me for review. None did. I specifically requested they obtain a copy for me...none did. I went to a major record store in the CBD, which didn't stock the album, had no intention of stocking the album, and had never heard of Black Light Burns ("The guitarist from Limp Bizkit"..."Aaaaah, him!...he's released something?). I finally found a little indie record store happy to order the album for me from the States. This was two years ago. 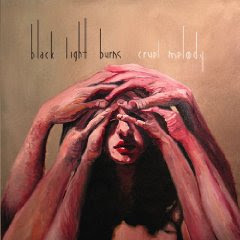 Now that I've started writing for myself and can publish reviews on whatever music I like, I have decided to write a review -- albeit some time following release -- of Black Light Burns' Cruel Melody. If I told you that I painted three of my best paintings to this album, would that mean anything to you? That it's both inspiring and interesting enough to invoke creative urges upon recurrent listenings? The collaborations on this album are a tad awe inspiring: Johnette Napolitano, ex Concrete Blonde (and if you've never heard of her, Google her immediately! ); Danny Lohner (not Danny Elfman, as someone in a chat room once argued to me) who has worked with Nine Inch Nails, Killing Joke, Marilyn Manson, Puscifer and A Perfect Circle; Joshua Eustis (Telefon Tel Aviv); Josh Freese (Nine Inch Nails, A Perfect Circle, Devo); and Charlie Clouser (ex Nine Inch Nails and producer / musician extraordinaire). The album is divinely packaged with cover and sleeve artwork by Borland himself, who as an aside, is an accomplished artist in the traditional sense. The sleeve also contains full lyrics, something I always deem as beneficial to understanding the intent of a song more fully. This album, from conception to birth, was obviously a labour of love. So, let's get down to it, shall we? I'm not going to philosophise on the lyrical metaphors or true meaning of songs; I am not inside Borland's mind, and prefer to leave that interpretation to you, the listener. It's more personal that way. What I will say is that the musical composition shows incredible maturity in its complexity and yet, it's consumer friendly. While I was vaguely aware of Borland's talents as a guitarist in Limp Bizkit, I didn't pay enough attention to their music to know the calibre of musician that he is. This is a superbly crafted album. Listening to it is like taking the first sip of an especially fresh, tongue tickling pinot noir, when you can taste the cherry and grape teasing of a depth to come. Borland's curiosity seems paramount to his success as a musician, always playing with new sounds, recording styles and instruments. As pretentious as this sounds, I'd call him a man of the New Renaissance. The major surprise of Cruel Melody is that Borland can sing...very well. The pitfall of being in a band as well known as his former is that people pigeonhole you. Borland successfully blasts this concept of him being 'just a guitarist' as he skilfully handles vocals, guitar, bass, programming, percussion, synths, piano, violin, cello, and drums. Mesopotamia, the first track, explodes from the stereo, a primal expression of tribalism. This slides straight into the sexual Animal, with its muddy synths. Lie, the album's first single (which, if you've seen the music clip, will remain impressed upon your memory due to the prevalence of two hot chicks in white hot pants smearing Borland's naked chest with a black substance) is a traditional rock construct and catchy as hell. I love the lyrics to this song: "I wish I could see this filth through someone else's eyes, 'cause ignorance was bliss". Coward is one of my favourite songs on the album, with soulful lyrics and a wonderful guitar line. "I'm aching for you, but you're bound to bleed if I adore you" is a concept many creative people can relate to; that of the darkness being a friend to inspiration, not necessarily devotion. Sonny Moore's backing vocals on this track are guttural and scorching. The title track, Cruel Melody, is an intriguing blend of dark vocals over an almost Beatle-esque jaunty melody. Carina Round joins Borland on vocals. Jump into The Mark, my favourite track on the album. When Borland sings "So cut out the heart, and watch the world burn down", I MUST sing along. This is an arse shaker, impossible not to have a bit of a thrash upon listening, even if it's in your bedroom. I Have a Need opens with some toe tapping finger picking goodness. The musical interlude after the chorus harkens back to goth / new romantic bands of the '80s, such as Sisters of Mercy and The Cult; that lovely, jangly guitar sound. (Maybe I should learn a more technical term to replace 'jangly', but the musicians I asked use the same word.) 4 Walls, the second single from the album, has a funky vocalisation and is another potential commercial hit. It has 'radio friendly' stamped all over it...so someone over here should play it on air! Stop a Bullet begins with a heartbeat and builds to a cardiac arrest. One of Yours sounds like a lament on his time with Limp Bizkit...I could be wrong. Some mesmerising guitars and something haunting about this song which I appreciate. Very Cure in some respects. New Hunger has elements of Visage's Fade to Grey, Ultravox' Vienna, Duran Duran's The Chauffeur (actually sounds like something Nick Rhodes would write). Very 'new romantic', in my mind, perhaps because I grew up during that era so that music is known to me. I am where it takes me literally sends shivers across my skin as I listen to the opening melody. The combination of Borland and Napolitano's voices is a tasty recipe that should be repeated in future. The song demands I close my eyes to fully appreciate each note, each vocal, the wonderful cello singing away in the background. Another favourite. The album ends with the sublime instrumental, Iodine Sky. I understand music leaves markedly different impressions on each listener, but this song always brings back one specific memory to me: that of sitting on a hill, looking out over the white desert of Granada in Spain, across to the Alhambra, the snow capped mountains in the background and the hint of oranges on the air. The piano is childlike and mesmerising. Cruel Melody is a succulent offering from Black Light Burns, and I actually pity anybody who hasn't heard it. Not buying this album should be a sin and, if you are a lover of music, regardless of genres, you will find something in Cruel Melody which will move you. Two years on, this album touches me in different ways still, and never ceases to surprise me. I played 'Cruel Melody' as I read your review. A well-written piece of passion, and I look forward to more.